GREAT FALLS, VA – We admit it, referring to a $1.6 million dollar home as a “great deal” sounds like a bit of a stretch. But we’re certain you’ll agree — after reading the first three paragraphs of this blog — there’s real substance to this claim thanks to the myriad benefits of the luxury homes at CarrHomes’ new community, The Meadows at Great Falls. For this new community in Great Falls, we started by embracing the natural advantage of location and setting. Our wooded one-acre homesites encircle a private cul-de-sac in a premier residential neighborhood between Tysons Corner and Reston. Then we offered a broad choice of six luxury home models which range from 5,300 to over 10,000 grand square feet. Finally, we introduced our new Craftsman Series of designer homes, which along with our award-winning Colonial Series now means more design choices than ever. We think it all points to great value. But now, for a very limited time – until October 31, 2018 – it’s more than a great value. It’s a bright rear morning room and a fully-windowed side conservatory, custom finishes and extra architectural detailing, stunning kitchens with the ultimate in appliances. It’s more living and entertaining space. More personalization. It’s your choice, and it’s a great deal because we’re offering $100,000 in FREE options with a new luxury home purchase at The Meadows at Great Falls. 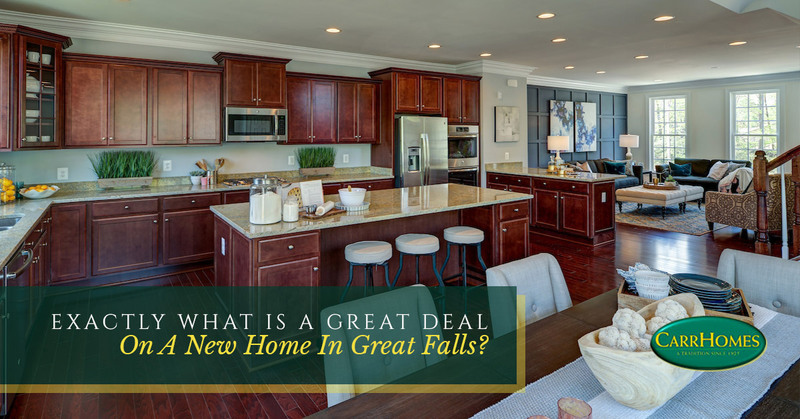 If you agree it’s a great deal or you want to know more about our new designer homes at The Meadows at Great Falls click here. Or email lhargadon@carrhomes.com. If you’re still not convinced, check out our competition, and we’ll see you soon.